SEATTLE (AP) — The last of the estimated 125,000 Washington state children who missed the start of school because of teacher strikes are now all going back to class, ending a series of teacher strikes over pay raises that escalated some cases to court and state intervention. South of Seattle in the city of Tumwater, teachers ratified a new work contract agreement on Monday after a 16-day strike. Tumwater teachers were the last of the Washington state educators on the picket lines and school is expected to start for the district’s 6,800 children on Tuesday. Tumwater was among the 13 school districts across the state that had teacher strikes over a monthlong period that began in August, affecting about 11 percent of the state’s 1.1 million school children. Bargaining units at most of the state’s 295 school systems had sought to renegotiate salaries this year after the state infused at least $1 billion for teacher pay to resolve a long-running court battle that determined the state was inadequately funding public education. Most of the disputes were negotiated quietly and many ended with double-digit percent salary increases for teachers amid orders from the lawsuit and as political dynamics with the “Red4Ed” protest movement shifted the national conversation about teacher pay and value. In Washington state, teachers largely prevailed despite escalation tactics on both sides. 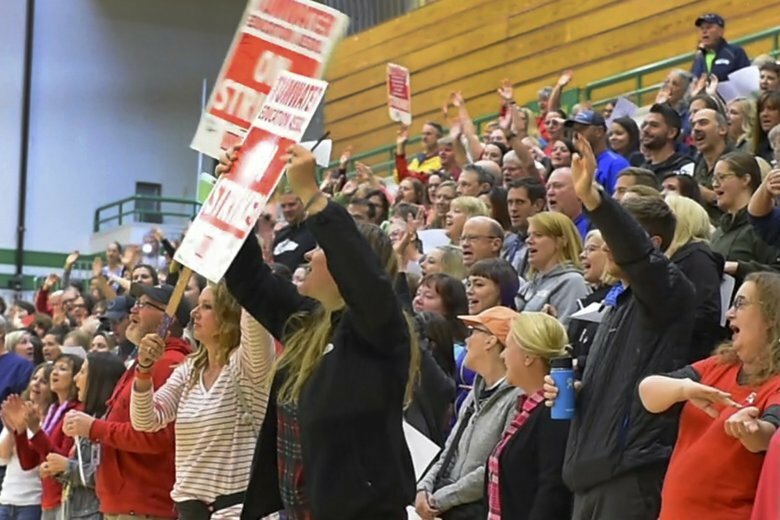 Tumwater teachers were among the two unions dealt a blow when the district sued them to get them back into the classroom and a judge declared that the teacher strikes were illegal. Tumwater teachers resisted that order, as no penalties were imposed, but they were due back in court on Monday. New contract terms with 16.7 percent pay raises were then reached by late Sunday. Monday also marked the first day of school for Tacoma Public Schools, one of the state’s largest districts, after teachers went on strike for 10 days. The teachers’ union had rejected the district’s call for a state arbitrator before winning 14 percent pay raises for all certified educators and 19 percent pay raises for office staff. The Battle Ground School district had similarly asked for the state’s rarely-used Public Employment Relations Commission to provide third-party “fact-finding” that could have resulted in non-binding pay recommendations, which the unions had decried as a stall tactic. Angel Morton, president of the Tacoma teachers union, said teachers and school staff are now working to repair their relationship with the administrators. “We ended up with what we asked for all along,” Morton said. Other school district teachers also threaten to walk off their jobs by voting to authorize strikes. Teachers at Seattle Public Schools, the state’s largest district, did so but soon reached a one-year deal giving them 10.5 percent raises just before the first day of school with a new superintendent at the helm.